I’ve had quite some luck getting DVR-MS files to automatically display images (downloaded from AMG, I think). I wanted to show my offline library, so I created blank DVR-MS files and filled them in with the movie information – it works great. I can only get my dvd to show them if I put the files in the UsersPublicRecorded TV directory – which means they also show up in recorded tv. How were you able to get my dvd to find DVR-MS files outside of the recorded tv directory? Or do you know of a way to get recorded tv to either group or ignore dvr-ms files? 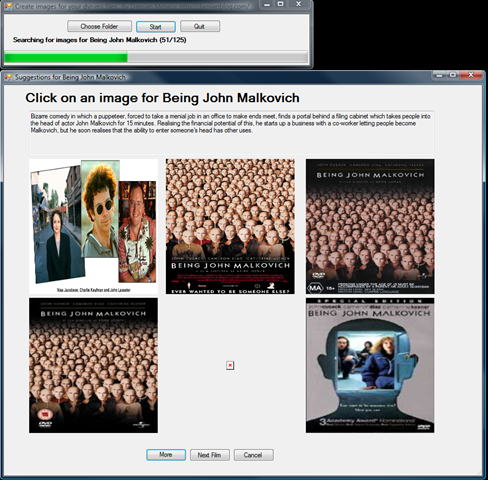 I’d be happy to send you examples of DVR-MS files that will automatically download images, cast info, reviews and similar movies if you’d like. I think I just added a new location for TV under the Settings menu. Thanks for the fast response. Do these movies also show up under Recorded TV? If not, is there any way you could send me the metadata they contain (via private email). As far as getting the cast, cover, reviews and similar movies to show up – it looks like the “Title”, “WM/OriginalReleaseTime”-(year only), “WM/MediaIsMovie”-(True) need to be set. Then it will look it up from AMG’s database. I’d be happy to send you a blank DVR-MS file with the required metadata if you’d like to try it. I can’t wait to try this out. It sounds like exactly what I’m looking for. I’ve got a question for Jeff about the editable .dvr-ms files you spoke of. How did you create it and can you get the thumbnail to match the cover art of any movie? What I actually do to create a “blank” dvr-ms file is to take a recorded program and use VideoReDo to edit out the video (just clip it all out) – sometimes, but not always this results in a dvr-ms that media center will recognize (about 80KB-90KB in length). Once I have a usable “blank” file I use EditDvrmsMetadata (http://toub.members.winisp.net/Code/EditDvrmsMetadata.zip) to edit the metadata. The movie synopsis, actors, covers display automatically under My DVDs (only if the dvr-ms file is in a location that will be search for Recorded TV). Unfortunately, the file also shows under Recorded TV – I’ve never figured out a way to get rid of it, exclude it from the list, or somehow group them all together. Under Recorded TV, there is no image (after all the video is missing), but when selected it will bring up a page with the covers, actors, etc. One thing to watch for is that Media Center seems to cache some metadata from the files. I get around this by editing the metadata first and then renaming the file. If you’d like I can send you a sample dvr-ms file to play around with – just email me at j_ef_fhi_ll42_@gmail_.com (remove all the underscores). Please let me know if you ever figure out a way to group them, or somehow exclude them from the Recorded TV list. I have been working on getting my dvr-ms ripped dvd’s into “DVD Library” via WHS and was curious if you are saying that by creating this blank dvr-ms file you can group all of your movies in “recorded tv” under that one file. Is that correct? Sorry if I gave you the wrong impression. I have not been able to either group them or exclude them from recorded TV. If you figure out a way, please let me know. Big fan of this utility, but any chance of an update to support TV pack 2008 *.wtv files? I don’t have the pack installed yet, but if it works the same way as the dvr-ms files (an image file with the same name as the wtv file) then it should be very easy to add — do you know if it works that way? The WTV files are about 20% larger to contain additional languages, subtitles and other content but strangly the metadata exposed in Windows Explore is less than dvr-ms. The .wtv films still do get displayed in the DVD library, so some similar mechanism must be at work. Just wanted to say thanks for your help on attaching jpgs to recorded TV movies. If someone sends me a WTV file I can look at updating this tool to process them too. Hi, Could you also send me a blank metadata file for the changes mentioned above. I have tried creating an image file with the same name as the movie but it doesn’t show up. I am running Vista Home Preminum Media Center. Hi, this will save me some time – many thanks. To perhaps offer an option to group movies out of recorded TV – I had a play with the meta data (using editDVRMSMetadata). Usually have to move the DVRMS file into a subfolder to get MC to recognise the metadata change. Once done for all movies they are all grouped under My Movies under recorded TV. The only downside I found was that they were then sorted by the air date of the movie rather than alphabetically – and I wasn’t using any movie sorting applications then. Maybe someone with a bit more knowledge could auotmate the process if its useful. I tried edigint the Title and WM/SubTitle keys but I’m not getting the movies to group. Were there any other metadata fields to edit to make grouping happen? Hello, I love this little program, But I now have tv pack 2008 installed, and It’s driving me nuts that there is no thumbnails in dvd libary would pay for an update please please. I thought I’d lost the source to this program, but recently rediscovered it – I’ll try to get round to updating it. I’ll post to my blog when I do.